This week’s guest on Coffee with a Journalist is none other than Sal Rogriguez from CNBC. Sal sits down 1:1 with host Beck Bamberger and goes into detail about his upbringing in Texas, his start in journalism at ASU, his big move from LA to San Francisco and more. Salvador Rodriguez is a reporter for CNBC, covering Facebook and all things social. He’s no stranger to the tech industry and has written for Inc. Magazine, The Los Angeles Times, Reuters and International Business Times. He has also contributed to Digital Trends, Vice, and identifies as a trilingual journalist. Click below to listen to this week’s episode featuring Sal Rodriguez and learn more about his beat at CNBC and the pitches he receives on a daily basis! Jered: Welcome to this week's episode of Coffee with the Journalist, and it's a podcast that's just that. We got coffee, we got journalist's, we got lots of good conversation. I'm Jered Martin, I'm the co-founder and COO at OnePitch. Beck: And I'm Beck Bamberger, also the co-founder of OnePitch, the CEO of BAM Communications, and your host for today's show with Sal Rodriguez. He's from CNBC and I just love Sal. I had a great conversation with him, he was born in Mexico, he grew up in Texas, he started something called the Downtown Devil, which is still an online publication that exists today, while he was becoming an editor there on college campus, and now he's gonna tell us a little bit about how he got into CNBC's media headquarters. Let's take it from here. Beck: Sal Rodriguez, thank you for being here. Sal: Yeah, thank you for having me Beck. Beck: It's Coffee and Journalist, Coffee with the Journalist, you have a coffee mug, no coffee in there. There's water. Sal: There's water, but yeah, I had coffee earlier. Beck: Yes, this is what I'm finding. We gotta shoot these or do these in the morning so people are like, "Okay, I need the coffee to get going." Sal: Yeah maybe. You know I actually try not to have coffee too often, just because in this industry you do become an addict quick, but today when I was having coffee just during my meeting I definitely could tell just how quicker I was starting to talk as I was having it. So at least it still works for me. Beck: Yeah, okay. So you can tell the difference in yourself. Sal: Today was like probably the first time where I was like, "Oh my God, I'm talking much faster now." So in general I love coffee but I try to only have it as a treat. So I try to limit it. Beck: It's probably a good motto. Beck: Well you've been quite a few places since you started in your career. You've been at Inc., you've been at IB Times, you got L.A. Times on here, now you're at CNBC fresh in the saddle there, which is exciting. Take us through a couple things. You started in Arizona, Arizona University or Arizona State. Sal: That's right, Arizona State. Definitely ASU, not U of A.
Beck: That's right, a big distinction there. Sal: Yeah, big one. But yes, I'm a Sun Devil and then from there I went over to the L.A. Times, did a lot of tech blogging, tech reviewing, was there for a while. Then I moved over to the International Business Times, which was a lot of fun while I was there, but of course if anyone's been paying attention they know that they have links to a Korean culture, and if you haven't been paying attention I definitely encourage you to look it up 'cause it is fascinating stuff. I was at Inc. Magazine for almost a year and that was a lot fun, just focusing on the start-up space and venture capital, and then for the past year and four months I was with Reuter's just covering Microsoft, Sales Force and then toward the tail end a lot of Tesla and that was a lot of fun 'cause the reporters there are all so talented so I got to learn a lot from them. Beck: So now you're at CNBC? Sal: Yeah. So now I'm over here, gonna be covering Facebook and it's really exciting. It's a very young but very ambitious and talented team that I'm working with, and of course Facebook is a fascinating company that's clearly going through an interesting time so it should be hopefully a lot of fun. Beck: Also, I'm sure you're not gonna be bored with things you can write about. Sal: No. Yeah, I'm into week three and it is nuts. Like the speed of this particular beat, it's super-fast and I'm trying to get a foothold but I think it'll take time, but I'm also confident that we'll get there. Beck: How did you, when you were first getting there, know that you were gonna be covering Facebook? Was that covered well before and like, "Hey this is gonna be your beat and do you really wanna do this?" Or did it come to you? How does this get determined? Sal: Yeah, so basically I think CNBC took notice of my work earlier this summer. And so when they came at me they were, it was very clear that they were committed to getting me to go over there and so credit to my editors, they did a very good job navigating that whole process. And basically they came to me asking if I wanted to cover Apple or Facebook. And so at this point I thought that Facebook was the more interesting beat, just 'cause they have their hands in so many different places, they have all these interesting apps, obviously issues with privacy, with data security and certainly drawing the ire of lawmakers both in Europe and the U.S. So it seemed like a lot of fertile ground there, but that's editors. Any other journalists out there who are interested in covering Apple that's still an opening that we have at CNBC and so I know my editors are still very eager to fill that role and in general just keep expanding the team in 2019 so it seems like a good time to be at CNBC. Beck: Well it seems like, I was gonna say, dare we say there's a media outlet hiring? Sal: Oh yeah. Certainly at CNBC, and then at Reuter's I know that they're also expanding that team as well and I think just in general tech reporting is a good area to be in. This is one of the most important industries in the U.S. economy that has been growing for a long time and is now starting to see more competition from foreign markets, China in particular. But I think tech reporting is really valued so as we've seen, these companies certainly need watchdogs, and there are a lot of stories to be told. Whether it has to do with U.S./China tech relations, just tech in policy, tech in cybersecurity and then just consumer tech and as well as enterprise tech, there's so much to cover and I don't think there's enough journalists that we can throw at this. Beck: That's incredible. So that's your advice, I would say for anyone in journalism right now looking to have a career, look at tech. Sal: Well I mean tech is like one great area for sure. I mean I would say that it'd be great if we had like one reporter minimum on pretty much any topic, company or organization that matters in this country and all others as well. I think that when you don't have watchdogs, companies and organizations and individuals get complacent or they start to do things that they shouldn't and so it's just good when there is someone keeping watch and just making sure that things are going how they should be. Beck: So you're considering your job as the watchdog policing I would say even of what Facebook is up to and so forth. Sal: Yeah. Well I mean it's a big world, so you gotta have eyes on all these things that matter, and there's gotta be accountability. And so I think fortunately in the topic areas would that drive a lot of clicks and therefore advertisements? We have good watchdogs, and this can be anything as unimportant as fantasy football. Like I think I get plenty of information there and I'm grateful for it, but it would be awesome to have just as many eyes on things like your local city council or other matters. Sal: I know that, you know I'm a big sports fan and earlier this year I was reading a piece about what went wrong with the U.S. Soccer team, they didn't qualify. And the article that I read, which is by The Ringer, I think they essentially made the point that there just wasn't enough soccer journalists in the U.S. keeping watch over that soccer federation and that was part of why that organization failed to grow and do what it needed to do to qualify for the World Cup this past summer. Sal: So I definitely think that journalist, that's like a big role in what they gotta do, and so I know when I was in school a big phrase that I tried to apply to my journalism was, "Hold the powerful accountable and give voice to the voiceless." Or I think another way to say it is, "Afflict the comforted and comfort the afflicted." So yeah so that's only like two phrases that I try to go by. And so yeah, with Facebook we'll certainly be keeping watch. I think in the tech industry there's lots of talk from these companies about making the world a better place and so if that's what they want to include in their marketing materials then that's the standard that they get held to. Sal: And then just in general we've seen the implications of all these products and services and technology on our mental health, our democracy here and democracies abroad. And so there's certainly lots of ramifications and so that's why it's good to keep watch and get a sense, a good sense of what exactly they're doing. Beck: Thank goodness you're doing it, and there's not enough people to do it, frankly. Sal: Yeah. Well I consider myself lucky just 'cause these days yeah. Journalism is so tough and I have so many talented friends who've had to leave the industry and so I think it's a credit to both my work ethic but also a lot of luck as well. Beck: Mm-hmm. Now when you have a beat that is so narrow as a single company, Facebook, which has many different companies in it and all these different things. Sal: Right. Well so technically my beat is social media. Sal: But these days Facebook, through their own successes in the market and their own failures, they are dominating the headlines here so...but you know I'll also keep an eye on Twitter, obviously Twitter has a ton of influence in our society and also Snapchat just 'cause that's a company that's still very interesting, obviously it's public so at CNBC our readers are folks who are either professional stock traders or wanna know which company to put their extra money into. So yeah, so it's a little bit broader than Facebook, but certainly Facebook will be the focal point. Beck: Then with that, how are you gonna go about, especially since you're new with this beat, getting deep in there and finding the right sources, contacts, etc. who could give you those scoops? Without exposing any of your tricks or secrets here. Sal: Right. Well I mean I think you know the main tactic that we're gonna approach it with, at CNBC it's just kinda see unanswered questions with the company. So it's a very large company that's many years old at this point, I think they're 14 years old. I believe there's about 35,000 current employees or so and who knows how many ex-employees and other stakeholders, anything from contractors to users to shareholders and everything else that you might include. Sal: So with those questions, especially the ones that draw my interest or maybe the ones that aren't getting proper attention from other reporters in this base, I think I'll probably gravitate to those areas and just try to add to this story. I certainly take the approach of not replicating what my peers are doing. I think that there's so many stories to be told that I don't often find the point of telling the same story that someone else has already told, I'd rather kinda focus in on an area that hasn't got in the proper attention and so go from there and yeah, it's just a matter of being relentless and reaching out to folks on cold calling, cold messaging, you know whatever it takes, but just trying to get to the answers for the questions that interest us. Beck: So that's interesting because from what I've, listening to others journalists say they get a lot of inbound, they get a lot of pitches of course, they gotta like filter through all of that and then figure out maybe something stands out and they can then write about it and stuff like that. You need to go out and dig, so you need to do a lot of this cold outreach, not that others don't but I would say, even more particularly as you're trying to tackle this behemoth, you gotta go out there and dig it yourself, because let's talk about what pitches you get. Do you get anything that's decent in you inbox at this point? Sal: Right now my inbox is actually pretty bare still, which is nice and also kind of unfamiliar for me 'cause there's been places like, the only times where I wake up and like there would be 60 emails in my inbox already, and then of course a good chunk of those are also internal email, but it felt like a lot of 'em were external. And I think that made more sense back then and probably also at Inc. where I was just more of a general tech reporter so it's a bigger basket for the PR folks to try and shoot into. Sal: But with such a specific beat over here I do think, I'm getting the sense that like the PR folks that are looking at me or I've worked with in the past are finding it a little more difficult to figure out exactly what's the best way to gain my attention, and so I'm still trying to figure that out as well and also just adjusting to the types of stories that we're able to tell at CNBC, obviously at Reuter's it's pretty much we want scoops and we want exclusives and that's about it, otherwise we might not publish. At CNBC we certainly want scoops and exclusives and we want to break news and push the story forward but I think that CNBC also has the opportunity to tell other kinds of stories like news analysis, features, profiles, or just broader, longer video pieces. Sal: So those are, for me opportunities to tell different stories that I haven't been able to in a bit and certainly new ways to shine light on potential sources. I think the best way that for any of your PR listeners who are interested in potentially pitching me, I'd say that if you have any folks who have previously worked at Facebook, Twitter, Snapchat or their competitors and would be willing to chat with me, those are certainly folks that I would be interested in meeting. Sal: And fortunately at CNBC we are open to chatting with folks either on the record, on the background, off the record, maybe something will be written up about your client, maybe not but there are other reasons to talk with journalists and even if it doesn't work out now it could still be for your client an investment in a relationship with a journalist that perhaps pays off down the road in eight months or a year from now, whatever it may be. Beck: So if you know anybody, everyone listening, in the Facebook cohort, hit up Sal. Sal: That would be great. Yeah. Beck: See what you get, okay good. Yeah, that's good. Well one thing I noticed that stood out to me is you not only say bilingual you say trilingual. So what do you speak? Tell us all. Sal: So I speak Spanish that was my first language, and then English. I grew up here in the U.S. so English is my strongest language. And then in college and right after college I began to learn Portuguese just for a couple of reasons. My business journalism professor at the time, he would stress on and on that it wasn't enough to be a bilingual journalist anymore, you really needed to know three languages. And so he always mentioned that, and that's Andrew Leckey at ASU so he's also a long time journalist, so maybe some folks who are listening might know him but he would just stress that constantly while I was in school. Sal: I also knew that I wanted to go to a World Cup at some point in my life and at the time the options were Brazil, Russia and Qatar, and I had no interest in going to Russia or Qatar so Brazil made the most sense. And the funniest part is that at some point in college I just got so far ahead that I had like one semester where my week started Monday afternoon and ended Tuesday afternoon. So I had like a five-day weekend and I was like as amazing and fun as this might be, I probably shouldn't waste my opportunities here, and so I decided to try my hand at Portuguese and that's like a language that I basically ended up studying for about four years and I think it did pay off. I ended up going to Brazil for the World Cup with my dad and at one point there was a misunderstanding with some cops and I used my Portuguese to get us out of that situation. Sal: Yeah, and to me that felt like my graduation ceremony for Portuguese. And so now to this day, there's a good number of Brazilians here in the Bay Area so any time I run into them I make an effort to continue practicing my Portuguese and I probably should at some point book a trip to Portugal and go head and use my skills over there as well. Sal: I also, at one point started studying French 'cause I was running into quite a few french entrepreneurs here in the Bay as well and so while I was at Inc. they had a really cool benefit where if you wanted to take some sort of class that could help your career, they would pay up to a certain amount and so I decided to use that to take some French classes and so I was doing that and I was certainly learning the language but unlike with Portuguese French just to me, it was a weird funky language that I was getting, but I just wasn't enjoying speaking it, whereas with Portuguese, I literally just have so much fun to the point where like there have been times where I'm out at bars drinking with friends and I just wanna like speak Portuguese, even if no one around me speaks Portuguese. Sal: So I think Portuguese is just a language that I love and so ... I haven't used my Portuguese too much in reporting. I think maybe I've interviewed one, maybe two people in Portuguese and I've actually interviewed one person in French using Google Translate, but Spanish is certainly like, you know that one's come in handy quite a bit. At Reuter's I ended up helping them with their coverage of, you know just immigration these days and the child separation affair that is ongoing down in the border. So Spanish has certainly come in handy all the time, and especially in the Bay Area where there is still such a large Hispanic population, even if it's not in the tech industry. So it's pretty helpful to have those three skills. Beck: Does it help you too with maybe writing faster or is there some way that just having that extra area in your brain being used that it just facilitates better reporting or it's easier or somehow it's easier to string things together because you're using that side perhaps? I don't know if you can say you know but do you think? Sal: I don't think it's helped my writing in that sense and certainly English is still my strongest language for sure. I've written some articles in Spanish here and there, but before I turn them in to my editors I have my mom edit it and I've done that at the L.A. Times and when I was freelancing for Digital Trends. Yeah, I think it's mostly come in handy when interviewing folks who prefer speaking in Spanish or folks who prefer speaking in Portuguese, I think it's helped as another way to connect with people. Sal: I think if you run into a source who perhaps is of Hispanic descent or Brazilian or Portuguese descent it's another way where they might feel a little more inclined to trust you, so it makes me a more interesting person and allows me to connect with sources 'cause you never know what is gonna be the thing that really gets them to trust you. I think when I was covering Tesla, I called up one worker who didn't seem particularly inclined to trust me, but that person noticed that I was from Houston and they were from that general area as well and I think that's pretty much the only reason they talked to me. Sal: So I think really displaying to sources who you are and what you're about is helpful and sometimes they'll trust you because they share commonality with you and other times they'll trust a colleague of yours because they're the ones who connect and so that's why I'm actually a big fan of collaborative journalism which was really big at Reuter's and I'm getting a sense that CNBC is also very much open to that as well because like I said, when a source doesn't jive with you maybe they'll jive with your partner and vice versa and together you can make a really good story happen. Beck: And is that...what will you coin as is more than one person, reporter or editor and such, using whatever tools, tactics they can to solicit and get the resources, needed for a piece. Sal: Yeah like, there was one story at Reuter's where me and a colleague both pinged the same person and that person didn't respond to me and ended up being such a key source to our reporting because they responded to my colleague. And who knows why that was, but it worked out and then together we put a really good story together. Beck: Collaborative journalism. Okay. What about your mentioning their trust? How to develop it you can obviously use, okay a different language, where I'm from, something like that. But for when you're really digging in deep and you're doing the investigative stuff, how do you get trust? How do you establish that with your source who's maybe going, "I really don't want to expose myself, expose my family, etc." I mean all the different things you would not want to talk to a journalist for. Sal: Right, right. From the get-go if I know it's a sensitive subject I let them know that, you know, "We're happy to chat on background, meaning I'll keep them anonymous and that can be something as helpful to the reader as a former company employee said or if the source is that worried we can keep it even more vague in certain situations such as like a source familiar with the matter and certainly I'd prefer an on the record source and there are some stories that you will not be able to tell unless you have an on the record source. Sal: So I try to explain that to my sources as well because I'd say most people in this country don't take journalism as a class, obviously like I went to journalism school, so I'm a huge exception. But a lot of folks don't even know how to get their news, I think that's obviously an issue that's plaguing the country at the moment. So if they don't even know how or who to get their news from, they certainly don't know how to speak with a journalist or what exactly off the record you would mean. So I try to be helpful to my sources and explain that stuff to them, I try to tell them that we can also chat on other services like Signal if that would make them more comfortable, over the phone, in person, whatever ... essentially just accommodating the source. Sal: But the other thing that I do in my reporting, especially when I'm reaching out to someone who I haven't spoken with in the past is there are times where I'll send them just some recent stories so that they can get a sense of my work and leave it up to them to determine if they think that it's credible and trustworthy and if they want to take the chance and chat with me. So it's definitely a big ask, but that's our job and I try to do right by my sources and tell a fair objective version of what they tell me and certainly reach out to all sides, we don't like to do "gotcha journalism", you want to reach out to, if there's a company that is the subject of perhaps maybe not the most flattering story you want to let them have an opportunity to weigh in as well. So that's kinda just my approach essentially. Beck: What happens to when you do contact the company and say, "Oh do you have a comment?" And "Do you wanna say anything?" And they say "no", what do you do with that? Other than state that that's what happened. Sal: Well, if they say "no" that just makes my job easier 'cause then I can say that they've declined to comment or couldn't be reached for comment that we can just publish. But usually it's not just a "no", if it's a big enough story, they're gonna wanna really sit down and talk to you about it, probably dissuade you from publishing. Or if not dissuade you dissuade your editors, and they'll do several tactics to make sure the story doesn't happen. Beck: Like what? Like what? Sal: I mean I've certainly had subjects call editors and then magically the stories have disappeared right? Or not disappeared but certainly not been published. When I was interviewing for this job I was asked what was my best story and I told them about a story that never saw the light of day because the subject called the editors and had 'em killed. Beck: Does it happen a lot? Sal: It hasn't happened recently. Like it didn't happen at my last outlet, it hasn't happened at my current outlet, but it has happened. And so, yeah that's certainly a tactic, but I think a more respectful approach from the PR end of things is, if it's a really big story I give the company just bullet points of like the story is gonna cover this, this, this and that, and then let them address whichever bullet point they want and sometimes they'll confirm let's say like five out of the seven points that you make and you go from there. You can debate it or your can present what you had reported from your other sources and what the company said about it, and then let the reader make up their mind. Beck: Now besides having a full-time job now at CNBC, you also run another publication almost now for 10 years, tell us about that. Sal: So while I was in college, me and a couple of friends, we started this publication called The Downtown Devil. Which is an independent student publication that essentially covers downtown Phoenix and the reason we did that is because ASU is one of the largest universities in the country, just an absurd student enrollment number. When I was there it was in 70,000s, and besides that they also have four different campuses. So the one that most people think about when they think about ASU is the Tempe campus, but the journalism school was in Downtown Phoenix, which is close but certainly a different area. Sal: And that campus was young when we were there and we could tell that there was just a lot of things happening in Downtown Phoenix both on the campus and off, and no one was telling those stories. I personally would pitch some of those stories to the established student paper and I'd say rightfully they didn't take interest in it because they were trying to serve the greater ASU student body and so Tempe's stories just took precedence and I thought that that was fair but I also thought that the Downtown Phoenix stories needed to be told as well. Sal: And so we decided to start this publication that would serve those folks in those areas and tell those stories and so that was something that we launched just as freshmen using whatever free tools were available to us so we would use the free version of WordPress as our CMS and we'd use like Twitter and Facebook to distribute and probably used Flickr to host photos, I can't even remember. We certainly used like the free version of Dropbox to like send articles to one another as we were editing, or excuse me our Word documents when we were editing. Sal: And yeah, that's how we got started and then these days there's four of the founders are still involved as publishers, but pretty much that means that we're just there to make sure nothing catches fire and hopefully there are never any lawsuits, so just kinda make sure that it remains the quality standard that we set it when we were there and hopefully it gets even better than where we had it. But otherwise, it's pretty much completely independent, it's just like student volunteers at ASU who are cutting their teeth at journalism and getting going and you know I think for the students what they get is experience in covering like a community and also they gain [clips 00:28:48] that they can use in interviews for internships and later for jobs. Sal: I often hear from folks how having The Downtown Devil on their resume is what made them stand out and get jobs. Beck: That must make you so happy. Sal: Yeah, yeah definitely. To the point where like this February it's gonna be turning 10 years old and so were gonna be celebrating that and then I think a year ago or so we went back to Phoenix and we noticed how there was a need at this point for there to be like a Downtown Devil alumni network and so that was a group that we started and just kinda like posting any jobs that we hear about in case it's of help to someone else who went through the Downtown Devil. And so it's been nice to see it grow and hopefully it continues to persist. Beck: Well speaking of persisting what do you think is the future of media? Sal: Yeah, well it's certainly an interesting time. I think the most immediate thing that I'm noticing is just many more places finally going to a subscription model, certainly we're seeing all sorts of services adopt a subscription model. Services like Netflix, YouTube, all that jazz and journalism might be a little late to the game but they're certainly hopping on it and I think that has a lot of promise. I think that after the last election cycle, more folks remembered why we need to pay for good quality journalism and I think a good chunk of those people are certainly putting their money where their mouth is and so that's necessary and appreciated. Sal: I think one of the more interesting outlets at the moment is The Athletic. They're VC-backed and it's paid for sports journalism. I saw someone that I went to college with, they went from covering the professional sports team at that city's local newspaper and leaving that job to go cover a similar beat at The Athletic and to me that really kind of emphasized where that particular company is at, where either they're paying much more than a newspaper or it's perhaps a more prestigious position than being at a local paper so I thought that was really interesting. Sal: At the same time I haven't seen any piece of content from them that has even made me sign up for a trial, so as a sports fan I don't think I need it yet, but I think if they keep going the way they are, perhaps that'll change. And I think in the tech industry we've seen similar models. Obviously The Information takes that approach and they've been around for a couple years now so that's really promising, but certainly there are some outlets that still believe that advertising is the solution, obviously that's the business model at CNBC. I think Axios pretty much goes with a similar type of business model, although a little more focused I think with sponsorship's for their newsletters. Sal: But I don't question that whether journalism will be around or not. If a bunch of freshmen at a college can start a publication that's now 10 years old and basically draws no revenue, then it should be possible to run a more successful and more professional organization. And the need for journalism will be there, hopefully it's not just bloggers who are doing it as like a side hustle on their hobbies, although it's great that they exist too, but yeah I think this is something that'll survive. But what is difficult for journalists is that whether the profession survives or not, sometimes it costs you your career and you get forced out. Sal: So that's unfortunate, and me and my buddies who started the Downtown Devil every time we see someone that we went to school with or someone that we like leave the industry it's always just kinda sad, but makes your grateful for what you've got. But I think we'll see the industry and the practice persist. Beck: Well thank you Sal. Thanks for hanging out with us. Jered: Thanks for listening this week to Coffee with the Journalist featuring Sal Rodriguez from CNBC. 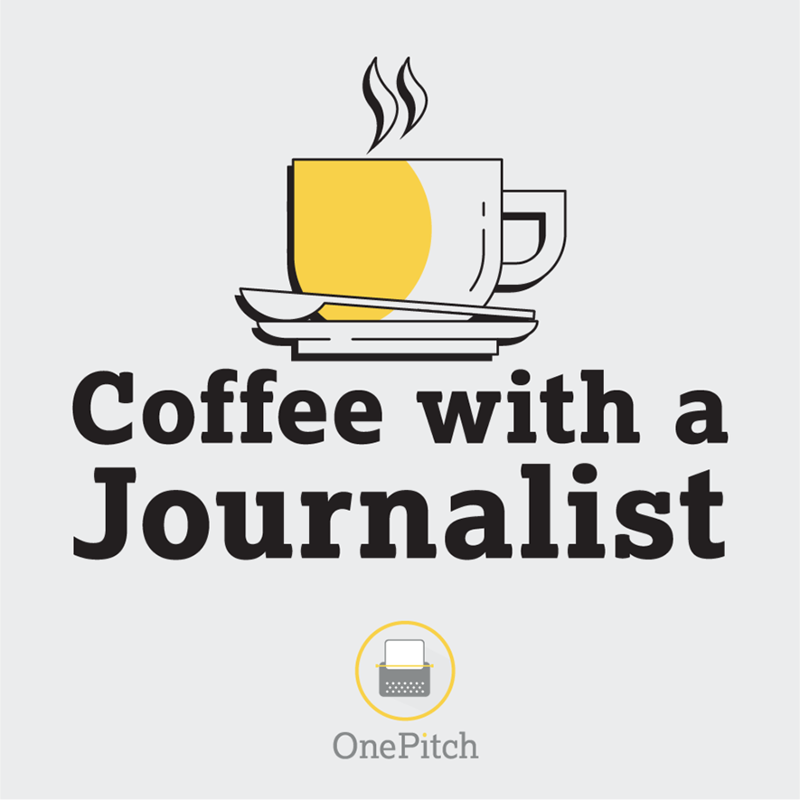 If you're a journalist who loves coffee or a publicist who loves this podcast we'd love to hear from you. Head to OnePitch.co to drop us a line. Until then let's end bad pitches and start great stories.